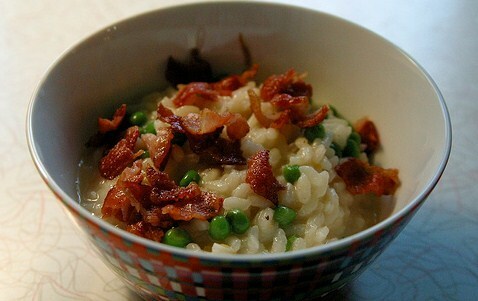 Pea And Bacon Risotto - 10 o'clock at night is not the most convenient time to want risotto, especially after getting home from a long day of standing on my feet at work. 'If I am going to stand up for another half hour, then I want to make something worth the extra effort. 'This does not disappoint. I have heard rumors that people get freaked out by making risotto. 'I know I certainly have. 'Maybe it was that one time I was watching Mario Batali make it, and he put such high expectations on making it and not messing it up that it was a long time before I got up the courage to do it myself. 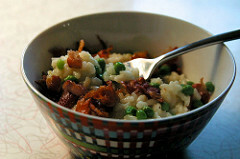 'Whether or not this risotto is Mario Batali quality is not the point. The point is that if you make this, you will be so glad you did, because it's simply delicious. Not to mention it's highly likely you'll already have all the ingredients. The only adjustments I made were to double the recipe and to use more bacon. Because in the case of bacon, more is always better. Bring broth and water to a simmer in a small saucepan. Cook bacon in a small heavy saucepan over medium-low heat, stirring, until crisp. Transfer with a slotted spoon to a paper towel to drain. When it cools enough to touch, break it up into small pieces. 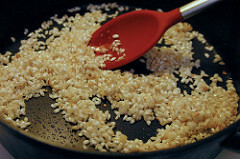 Add garlic to bacon fat in pan and cook, stirring occasionally, until pale golden, about 15-30 seconds. Add rice, stirring to coat. 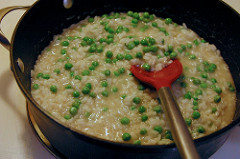 Add peas and cook, stirring occasionally, 2 minutes. 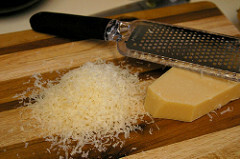 Stir in cheese, butter, zest, and juice. 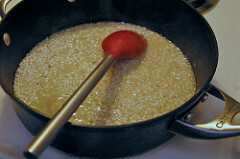 Thin risotto with some of reserved broth mixture if desired and season with salt and pepper. Top with bacon.